Looking for the best Cross Country Skiing trails around Pueblo? 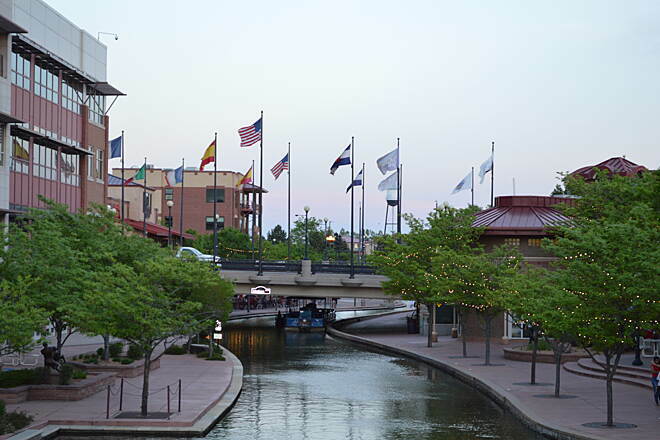 Find the top rated cross country skiing trails in Pueblo, whether you're looking for an easy short cross country skiing trail or a long cross country skiing trail, you'll find what you're looking for. Click on a cross country skiing trail below to find trail descriptions, trail maps, photos, and reviews. 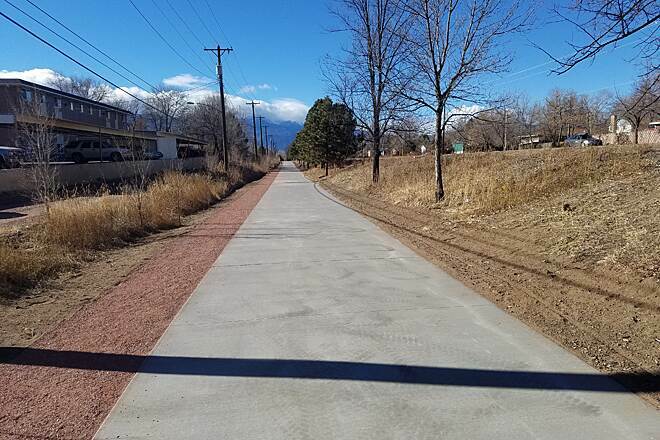 The Arkansas River section goes 3 miles beyond what TrailLink shows, and the Fort Creek section adds another 5 miles, all excellent concrete surface. 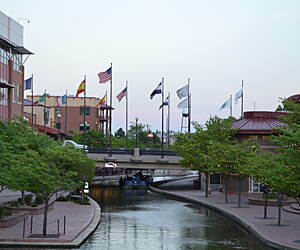 See https://www.pueblo.us/314/Pueblo-River-Trail-System for a nice PDF map. Great trail. I walk my German Sheppard on this trail. You can see all kinds of wild life. Trail is through Housing areas and runs north and south. There are a lot of bicyclists on the trails. My wife and son rode from North gate to Palmer Lake and back. It’s a good track that’s relatively flat as compared to section 16 that my son and I normally ride. Recommend this section for and easy ride. Wide concrete trail from Union east to Powers. Several sections were recently reconstructed. There are a few street crossings and an underpass at Circle Dr.
Road this trail on both my bike and trike. North of the bike shop was uncomfortable on the trike due to the very uneven narrow paved surface. South of the bike shop the trail has been reworked and is wider and smoother. Much better surface for trikes to share the trail. Update May 2017: New pavement on Naegele Road (US 24/Cimmarron St. Frontage Road) between 21st St. and 25th St.! Entering at Woodman Rd, we rode about 5 miles south. Convenient bike shop about .5 miles in. It's a pretty typical urban paved trail through industrial area along a stinky stream. 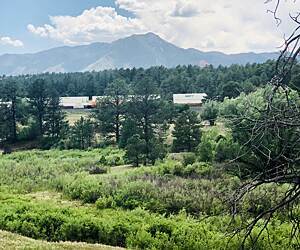 We parked at the Pikes Peak Greenway TH and rode the southern 10 miles out and back. Bathroom and water were still closed for the season here on April 16th, 2017 after a month of 70 degree weather. Gradual uphill in this direction but the rolling hills make it tough to realize the accumulated elevation. 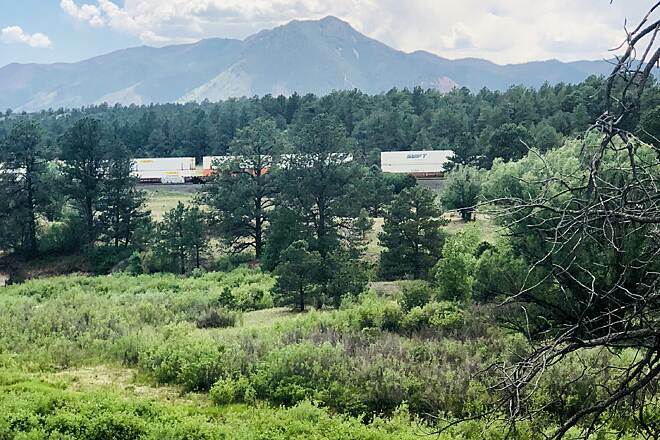 The trail runs relatively close to the freeway, but often seems on a distant prairie with frequent nice views of Pikes Peak. Trail surface is deep sand, loose gravel, with rolling hills. 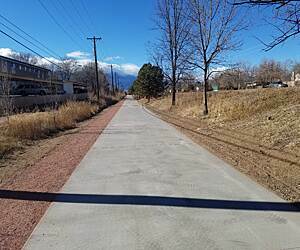 New concrete has replaced the old asphalt trail between Gossage Park and the I-25 underpass. The trail alignment is basically unchanged so some relatively steep sections remain. 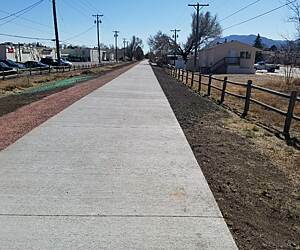 Trail Upgrade between Jackson St. and Fontanero St. is Complete! 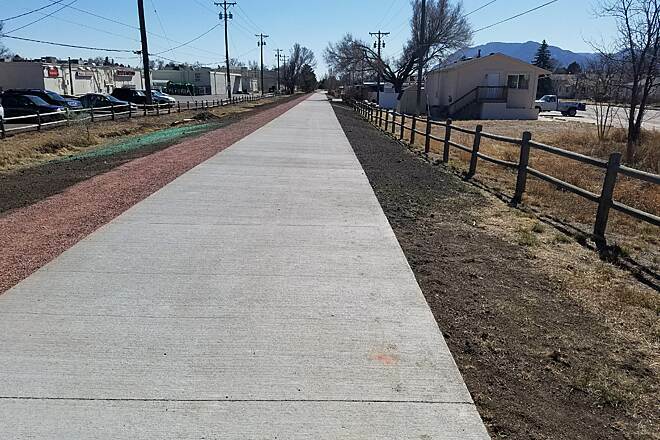 The old cracked and crumbling asphalt through this section has been replaced with new concrete and a gravel shoulder for runners thanks to ballot measure 2D! Awesome! First of all, being from Houston where it is flat and only about 60' above sea level, I was sucking wind getting to the gate, granting passage up to the Incline! I began my ascent and found the trail very well groomed and friendly for recreational walkers all the way up to serious fitness enthusiasts. I decided to turn around and go back down at the first non-step break in the trail as I was just in town visiting, on business. 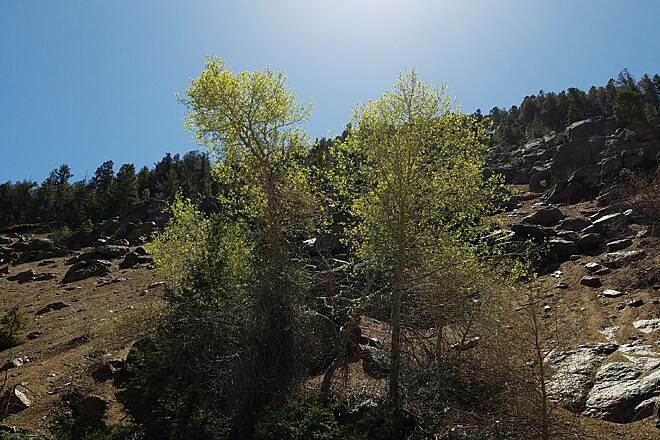 I decided that I would wait for my daughters or my sister to join me, making the climb all the way up to the top, but you are certain to get your day's worth of exercise out of the effort and the subsequent 3.6 mile descent down Barr Trail. 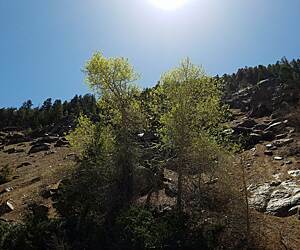 Parking is limited and it costs $5 cash to park at The Cog railway; best bet it is to catch the free shuttle in Manitou Springs Park (which runs every 20 minutes and is limited on stops). I look forward to returning and finishing the hike to the top.